For some people, the word abs stirs up memories that make them cringe — grade-school sit-up tests, planks ‘til you shake or resisting cookies, pizza and everything else that tastes good. For others, the word represents the ultimate goal — the sign that your body is lean and your core is strong. No matter what camp you’re in, your abs can be a difficult to train. But it’s not because the exercises are impossible to perform. It’s because we either a) treat abs like an afterthought by saving a few quick core exercises for the end of our workouts or b) figure there’s so much extra luggage around the middle that it makes more sense to spend time pumping up our biceps than trying to find our muscular middles. So let's clear up some misconceptions about abdominal training and focus on two things that should be a part of every workout: fun and results. For starters, you need to understand these four fundamental rules that'll help you get there. What’s the quickest way to get defined abs? Lose fat. The most effective way to do that? A proper diet. Eat fewer calories, increase your water intake and consume more lean proteins, fruits and vegetables. For decades, people have attempted to address their trouble spots with isolated exercises. If we’re talking about your arms, sure, doing bicep curls may help you add some size, but that's spot training, not spot reducing. But when it comes to your abdominals, crunches aren’t going to remove unwanted belly fat. Instead, use complex exercises that work more of your body while also challenging the abdominal region. Exercises like the push-up and chin-up may be considered upper body exercises, but both of them also stimulate the abdominal muscles. And make sure you fit in plenty of cardio during your weekly training to help burn calories and shed fat. Inevitably, you'll end up skipping what you save for last. Instead of devoting only a couple of sets to the abs at the end of your workout, design entire sessions that address your core. This way, you’ll no longer be able to replace your last few sets of sit-ups with a 500-calorie protein shake. For some reason, the fitness industry has worked to convince us that the abdominal muscles respond differently to intensity, frequency and duration than the other muscles of the body. Do you think doing chin-ups or squats for 30 minutes every day would be a good idea? Of course not, but many people don’t bat an eye at doing a 30-minute abs class five days a week. The fact is that your abdominal muscles need just as much resistance and recovery as the other muscles of the body. That’s why the following workout doesn’t use high repetitions and should only be performed twice a week max. This routine contains some of the best abdominal exercises around — and some of them don’t even look like abs exercises (though they most certainly are). 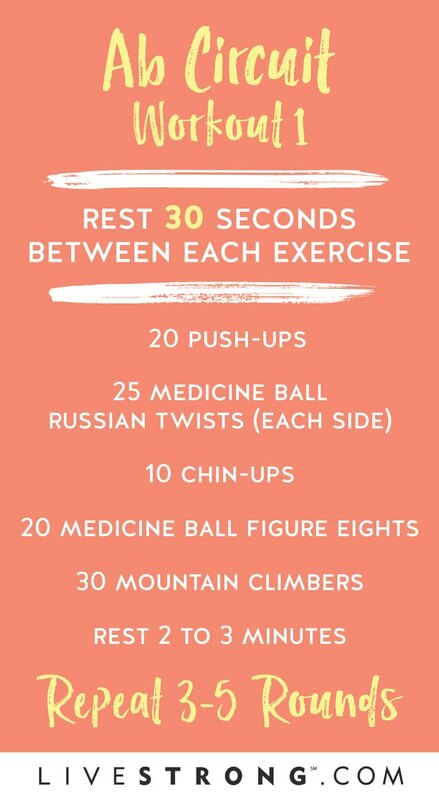 Perform each move in a circuit — do the required reps, resting for 30 seconds between each exercise. After the final move, rest for two to three minutes, and then repeat. 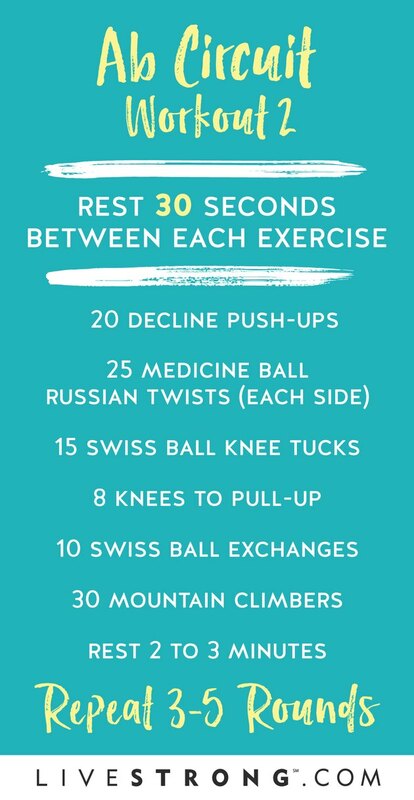 Perform the entire circuit for three to five total sets depending on your fitness level. Perform twice a week. How to Do Medicine Ball Figure Eights: Sit holding a medicine ball in one hand with your feet in the air. Raise one leg and pass the ball under the raised let and over the lower leg. Then raise the opposite knee and pass the ball back under that. How to Do Swiss Ball Knee Tucks: Place your hands on the ground and your shins on a Swiss ball so you're in a push-up position. Contract your abs and bring your knees to your chest, rolling the ball onto your feet. How to Do Knees to Pull-Up: Hang from a pull-up bar with your arms extended. Pull your knees to your chest, and then perform a pull-up. Lower your legs and repeat. How to Do Swiss Ball Exchanges: Lie on your back with your legs extended and your hands holding a Swiss ball overhead. Raise your legs and arms and transfer the Swiss ball to your feet. Lower your legs and arms to the floor. Raise your arms and legs and take the ball back in the hands. How Do Guys Lose Belly Fat and Love Handles? What Gym Exercises Burn Stomach and Chest Fat?